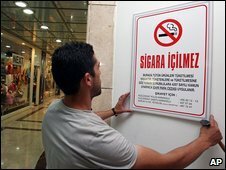 Turkey has extended an existing ban on smoking in public places to all bars, cafes and restaurants. The ban has come into force despite opposition from some bar and cafe owners who fear losing business. It comes after the government banned smoking from most enclosed public spaces in May last year in an effort to improve the nation’s health. 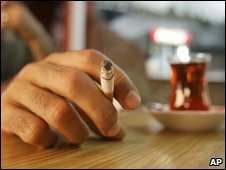 Turkey has more than 20 million smokers but polls suggest 95% of people support the ban. “We are working to protect our future, to save our youth,” said Health Minister Recep Akdag. Anyone caught lighting up in a designated smoke-free area faces a fine of 69 liras ($45:£28) while bar owners who fail to enforce the ban could be fined from 560 liras for a first offence up to 5,600 liras. Local authorities have hired thousands of extra staff to track down smokers and impose the fines. Many people in Istanbul said they thought the ban was a good move. “We were being destroyed in the places where you were allowed to smoke inside,” said Istanbul cafe patron Hanife Demirm. “I was choosing the non-smoking places automatically, but after the ban is extended I will not need to be selective. I’ll be very comfortable in every place that I go,” he told the AP news agency. But the BBC’s David O’Byrne in Istanbul says many Turkish people see the ban as an erosion of their democratic rights and have called for bars to be able to apply for a smoking licence. Some cafe owners have also said they were concerned the ban would drive away customers. “They will simply leave and never come back, or we would get in trouble for letting them smoke,” said Istanbul cafe owner Selahattin Nar. But Mr Akdag said there was no reason for cafe and bar owners to be worried about a drop in trade. “The public supports a smoke-free environment and the only ones to suffer will be the cigarette producers and sellers,” he said. A no smoking rule has been in place for the past 15 months in government offices, workplaces, shopping malls, schools and hospitals. All forms of public transport, including trains, taxis and ferries, are also affected but there are exemptions for special zones in psychiatric hospitals and prisons.